Beyond their direct effects on mortality, outbreaks of Ebola Virus Disease (EVD) might disrupt the provision of health care services in affected countries, possibly resulting in an increase in the number of deaths from non-EVD causes. 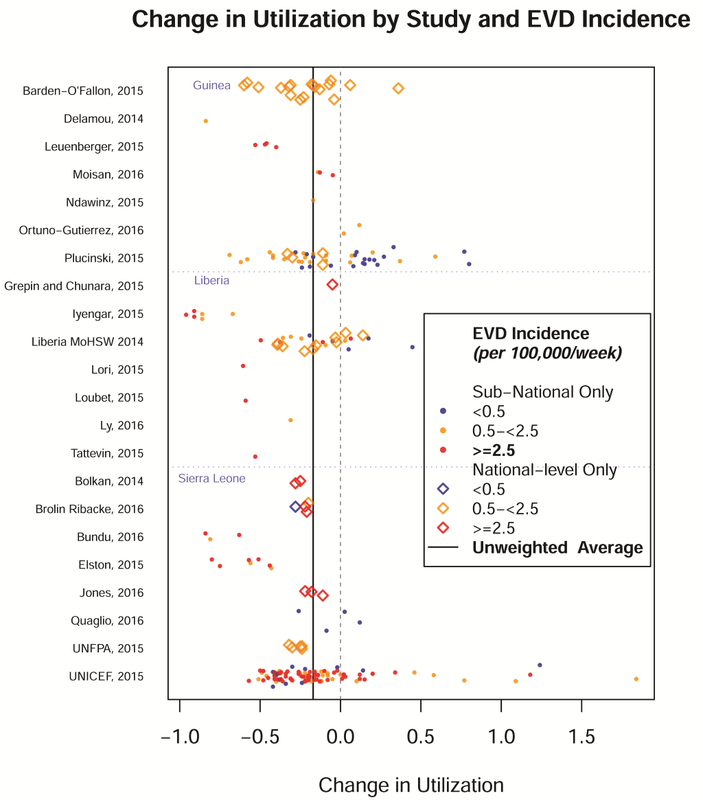 We conducted a systematic review and meta-analysis of studies documenting the impact of EVD outbreaks on health care utilization. We searched PubMed, Embase, Scopus, Web of Science, Cumulative Index to Nursing and Allied Health Literature (CINAHL), Global Health, Pascal and grey literature to identify observational studies that compared indicators of health care utilization before and during the outbreak. We identified 14 752 unique citations, 22 of which met inclusion criteria. All were related to the 2013-2016 West African EVD outbreak. From the 22 studies, we extracted 235 estimates of the relative change in health care utilization during the EVD outbreak. We used multivariate regression to estimate the average effect of the outbreak on health care utilization, and to assess heterogeneity across study characteristics. On average, health care utilization declined by 18.0% during the outbreak (95% Confidence Interval: -26.5%, -9.5%). The observed declines in health care utilization were largest in settings affected by higher levels of EVD incidence (>2.5 cases per 100 000 per week) whereas utilization did not change in settings with EVD incidence less than 0.5 cases per 100 000 per week. Declines in utilization were greater for inpatient care and for deliveries than for outpatient care. They were also larger in studies based on small samples of health facilities, suggestive of publication bias. However, several studies based on larger samples of facilities also observed declines in health care utilization. During the West African EVD outbreak, the utilization of health services declined significantly. During outbreaks of EVD, attention needs to be paid to the disruption of the health services, which can have large indirect health impacts. The 2013-2016 Ebola Virus Disease (EVD) outbreak in West Africa was responsible for 28 616 cases and 11 310 deaths . There are, however, strong concerns that the outbreak may have precipitated an additional number of deaths through its indirect effects [2-7]. These include, for example, deaths resulting from increased malnutrition and poverty in a context of reduced economic activity. The World Bank estimates the loss of GDP in Guinea, Liberia, and Sierra Leone due to Ebola at $2.8 billion USD through 2015 . Additional deaths may also have resulted from a sharp reduction in the coverage of essential health interventions during the course of the outbreak. Healthcare utilization, which we define as the use of facility-based formal health services, may indeed have declined for several reasons. First, the outbreak may have affected the supply of health services because health workers experienced a particularly heavy death toll; by June 2015, 515 health care workers had died . Since there were already few health workers per capita in the most affected countries, this likely significantly reduced the supply of health services. In some settings, this might even have precipitated the closure of some health facilities, or some selected services within facilities. On the other hand, the remaining financial and human resources were likely diverted away from the provision of regular health services and re-allocated to the Ebola response. Finally, some health workers may also have discontinued engaging in certain procedures that posed high risk of infection with EVD (eg, C-sections). Second, the demand for health services may also have been affected. Potential patients may have avoided seeking care at health facilities because they feared contracting or being diagnosed with EVD during their visit. In some settings, concerns about the potential for nosocomial EVD transmission  led to beliefs that health facilities should be avoided. Similar effects have already been documented in prior outbreaks of other infectious diseases, eg, the 2003 SARS outbreak, which was associated with a decline in health care expenditures for inpatient and ambulatory care in Taiwan . These dynamics of the supply and demand of health care during an EVD outbreak might have led to an additional number of non-EVD deaths if a) healthy individuals could not access preventive services, and b) sick individuals could not obtain required life-saving treatments. Early in the West African EVD outbreak, several studies thus projected that thousands of additional deaths from measles [2,3] and malaria  may result from the effect of the EVD outbreak on health care services, while others have pointed towards disruption of care for HIV  and reproductive health . Unfortunately, the extent of this indirect death toll has not been measured due to limited data on the number of deaths due to non-EVD causes that occurred both before and during the outbreak . Instead, several studies have documented changes in the utilization of health care services during the outbreak. In this paper, we attempt to summarize the evidence provided by these studies through a systematic review and meta-analysis. In doing so, we improve on a prior summary of this literature, conducted by Brolin Ribacke et al. (2016)  in several ways. First, we include eight additional articles published in 2016, as well as several reports obtained from national ministries and non-governmental organizations. Second, we only include studies with empirical data collected before/during and possibly after the outbreak. We exclude studies built on simulations, which may reflect the assumptions of the modeling team rather than the true effects of EVD on health care utilization. Finally, we conduct a meta-analysis of the findings. We searched PubMed, Embase, Scopus, Web of Science, Cumulative Index to Nursing and Allied Health Literature (CINAHL), Global Health, and Pascal. While databases were initially searched between September and December of 2016, all final searches were repeated on December 22, 2016. We searched all articles since the discovery of EVD in 1976 . The search vocabulary for PubMed (Box 1) was adapted for use with each database. All search terms were in English, except for French-language terms used in Pascal. No language restrictions were used in the literature review provided the articles could be identified using English and French-language search terms. 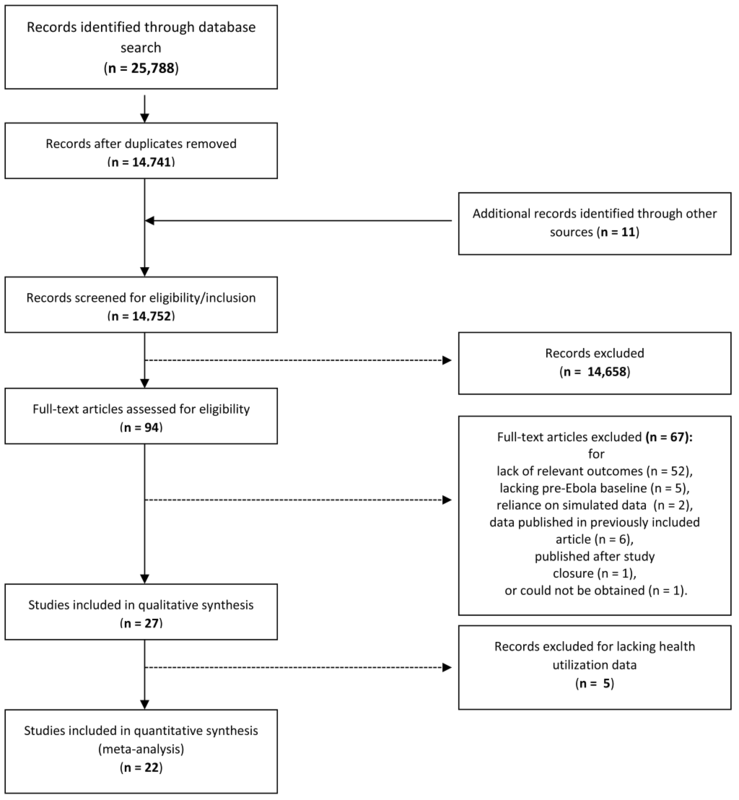 We did not register this systematic review, but we have followed the PRISMA guidelines (see Table S1 in the Online Supplementary Document). Since our study does not investigate the effect of an intervention, but rather evaluates the impact of a temporal exposure through observational data, various items of the checklist are not applicable. For example, detailed information on the participants is not reported consistently as it would be in a clinical trial. The seven databases we searched yielded 25 788 citations. We used EndNote to conduct de-duplication of records, using the method outlined by Bramer et al. (2016) . This resulted in a total of 14 741 unique citations. In addition, we added 11 articles from a) a grey literature search using Google Scholar (6 articles), b) forward searches of citations within articles (2 articles), c) suggestions from experts (3 articles). In total, 14 752 unique citations were identified. Two reviewers independently assessed the titles and abstracts for relevance and likelihood of meeting the inclusion criteria. Articles were excluded if 1) they did not contain quantitative empirical data documenting outcomes during an EVD outbreak and instead relied solely on simulations, mathematical models or qualitative data; 2) did not include comparison data from a pre-Ebola period or from a population not exposed to an EVD outbreak; or 3) did not include a health care utilization outcome other than EVD-related outcomes. One author, JW, supervised the title-abstract review process. The first 3000 citations were independently screened by JW and feedback was provided to reviewers. JW screened an additional sample of 3500 articles to ensure that all potentially relevant citations were included in full-text screening. JW did not identify any relevant citations missed by the reviewers. The title-abstract review identified 94 citations. Full-text articles were then extracted and assessed for inclusion by JW. A total of 26 relevant articles were identified. Reasons for exclusion at this stage included primarily lack of data on relevant outcomes, lack of a pre-EVD outbreak baseline measurement, and reliance on simulated data. Even though our search potentially included articles describing early EVD outbreaks (eg, the 2000 outbreak in Uganda), all remaining articles described studies conducted during the 2013-2016 West African EVD outbreak. One article recommended by an expert was excluded for being published after study closure. Figure 1 contains the flowchart describing these inclusions/exclusions according to PRISMA guidelines. Figure 1. Literature review flowchart. Two reviewers independently extracted data from the 26 articles using a standardized template, including information on study setting, design, analysis methodology, reported results, and limitations. At this time, reviewers also assessed study quality and recorded unreported study limitations. Study quality assessments were made by evaluating the methodology (pre-post, longitudinal cohort, cross-sectional) sampling methods (census, random, convenience), types of biases present (eg, recall, non-response), extent of missing data, number of facilities and duration of the Ebola period studied, and control for confounders, including seasonality. JW reconciled differences between the two reviews. We restricted our meta-analysis to 22 articles (identified in Table 1) [6,15-35] that contained information on non-EVD health care utilization. We excluded 4 studies [36-39] that contained only data on non-Ebola health outcomes, such as all-cause mortality. Table 1 presents key information for the 22 articles included in the meta-analysis. Each study potentially provided multiple estimates of the impact of EVD on health care (eg, if it included data from multiple districts and/or data on several types of services). From each of these papers, we extracted reported counts of patients/clients or coverage contained in tables, text, and/or figures. We classified the data by time period (before vs during the outbreak) and we calculated the relative change between the two periods. One study of facility-based deliveries  reported an odds ratio of 0.69 associated with the EVD outbreak, which we converted to a change of -31%. Although this is not a valid data interpretation without information on prevalence, we deemed it better to include the data point with some risk of bias than to exclude it. On the other hand, one estimate of trends in HIV services from a segmented linear regression model at a single hospital in Liberia could not be converted into a percent change . For each estimate of the relative change in utilization, we recorded study metadata including service type (eg, HIV treatment, family planning delivery), time period during Ebola outbreak (eg, early vs late), study location, sampling strategy used, controls for seasonal variation, data source (eg, health information system or ancillary survey), and number and level of health facilities in the sample. The time period of the Ebola outbreak is that for which we were best able to extract a percent change estimate of utilization from the article, which is not always the entire observation period studied by the original study. For example, Iyengar et al. (2015) track utilization from March to December 2014, but only report declines numerically for August relative to March. To control for the bias introduced in this way, we adjust for the duration of the Ebola period (in months) and the intensity of transmission (mean incidence during the period) in the meta-regression model. 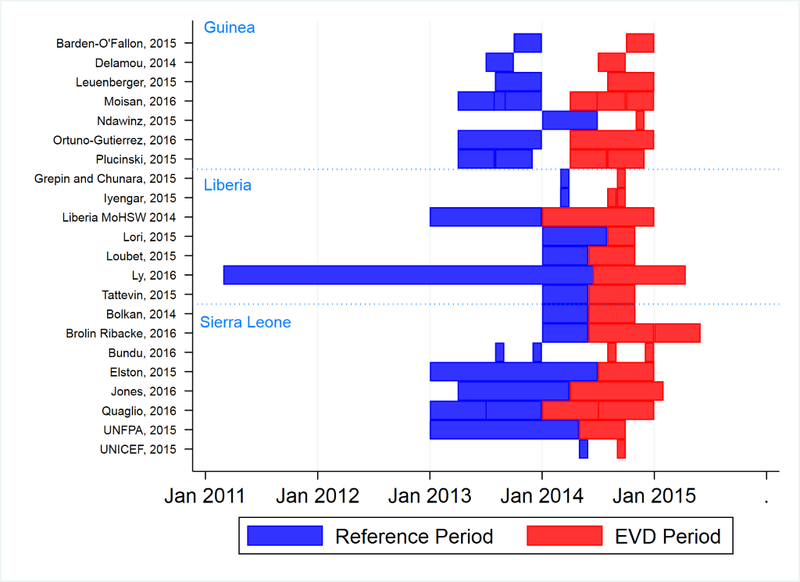 In order to identify the level of EVD incidence during the time of the study, we matched each study location and time period with data on EVD cases from Backer and Wallinga (2016) . We considered using peak incidence and cumulative incidence as measures of exposure to EVD under the assumption that health care utilization may be particularly responsive to a high number of EVD cases occurring in a short period of time. Ultimately, we use mean incidence rather than peak incidence, because the mode is subject to much more noise than the mean for rare events. We also considered using the number of past EVD cases in a location as our measure of exposure. However, most reported estimates of the impact of EVD on non-EVD health care services were based on the EVD period from the beginning of the outbreak, thus making cumulative and average incidence identical. In total, we obtained 235 estimates of the change in health care utilization during the course of the EVD outbreak (mean = 10.7 estimates per study, standard deviation = 21.5). Most studies reviewed did not report confidence intervals. This was so in large part because they relied on data from health information systems, which include complete counts/reports of the number of patients attending various health services for facilities that report (see Table 1). As a result, we could not perform conventional meta-analysis using inverse-variance weighting . Instead, we tested for differences in health care utilization between the pre-outbreak period and the period during the outbreak as follows. First, we used Student’s t test to detect differences in the mean level of utilization between the “before” and “during” periods. Second, suspecting non-normal distributions of study effects, we used the non-parametric, cluster-adjusted Wilcoxon signed rank test to detect differences in the median level of utilization between the two periods. Finally, we used ordinary least squares (OLS) regressions, in which the level of health care utilization was the outcome, and covariates included a dummy variable identifying the time period covering the EVD outbreak, as well as the metadata described above. We used OLS to identify potential sources of heterogeneity in the effects of the outbreak on health care utilization, with adjustment for clustering by study. We used a Wald-test to identify effect measure modification by sources of heterogeneity. The percent change was normally distributed, except at the extreme-right side. Regressions with log-transformation of the dependent variable to account for right-skew did not alter the conclusions. All meta-analysis methods were identified post hoc, after the studies had been reviewed. Data management and analysis were performed in R version 3.4.3  and meta-regression analyses were conducted in Stata 15 . Figure 2 presents the estimates by study and level of EVD incidence. One outlier representing a 500% increase from a low baseline  was dropped from the subsequent analysis. National-level data are available only for 48 estimates and sub-national data are available for estimates 188 estimates. If we aggregate complete sub-national data to the national-level, we can have 65 national-level estimates. Figure 2. Change in utilization by study and Ebola incidence. Of the estimates, 28 relate to facility-based deliveries (FBD), 41 to antenatal or post-natal care (ANC), 15 to outpatient department visits (OPD), 15 to forms of inpatient care (inpatient admissions, surgeries & C-sections) other than vaginal facility-based deliveries, 50 to malaria (treatment, prevention, and diagnostics) in an outpatient setting, 27 to HIV or TB-specific services, 20 to immunizations, and 39 to other services (eg, malnutrition, diarrhea). The mean incidence of EVD during the observation period for which the effect estimate can be extracted varied greatly. Eighty utilization estimates (34%) were derived from a setting with mean Ebola incidence of ≥2.5/100 000 population/week, 111 (47%) from settings with 0.5 to 2.5/100 000 /week, and 44 (19%) were associated with a mean incidence of Ebola of <0.5/100 000 /week, including 20 (8%) reported from locations inside of the affected countries that were free of Ebola during the study period. The mean duration of the Ebola period for estimates was 3.65 months (median: 3 months, IQR: 1-4 months). Ebola periods reported for estimates varied from Jan 2014 to May 2015 (Figure 3). ; however, most estimates of utilization during the Ebola period come from April – December 2014, which contains peak transmission period for the three countries that occurred between September and December 2014 . Baseline periods varied, but mostly fell between early 2013 and early 2014. Figure 3. Distribution of study reference and Ebola exposure periods (2011-2015). Table 2 presents the mean and median change in utilization during the Ebola period for all health services. The mean change in utilization was -18.0% (95% confidence interval: -26.5%, -9.5%) and the median was -21.0% (IQR: -37.8%, -4.9%). There was an apparent dose-response relationship with the local EVD incidence rate, with a change in health care utilization of only -0.5% in areas where the EVD incidence was less than 0.5 cases per 100 000/week, vs -18.0% and -27.6% in areas where the EVD incidence was between 0.5 and 22.5 cases per 100 000/week and greater than 2.5 cases 100 000/week, respectively. There was no significant change in mean utilization of health care services in the lowest EVD incidence category for any type of service. On the other hand, large declines were seen for EVD categories above 0.5/100,000/week for every service. Inpatient care exhibited the largest decline during the EVD outbreak (mean change of -44.3%, P < 0.001; median: -36.0%, P < 0.019) followed by facility-based deliveries (mean: -27.7%, P < 0.001; median: -22.5%, P = 0.004). Malaria services had the smallest change, but it was still -18.2% (P = 0.001, median: -24.0%, P = 0.112). One subset of services among the “other” category that actually increased by 22% during the outbreak was treatment of child malnutrition, but this estimate was based solely on data from one study conducted in Liberia. Table 3 presents the results of multivariate regression models. The difference between the highest and lowest EVD categories is significant with conventional standard errors, but not after controlling for clustering of estimates within studies (-21.4 percentage points, P = 0.08). A Wald test for effect measure modification by EVD incidence is still statistically significant (P = 0.007). Declines in health care utilization were larger for inpatient services & facility-based deliveries than for outpatient services (-10.5 percentage points, P = 0.004). Several features of the study design were associated with the magnitude of estimates. For example, estimates derived from a single facility or with no data on the number of facilities had significantly larger declines in utilization than those with 51 or more health facilities included. A Wald test for number of facilities is significant (P < 0.001). Estimates for EVD periods greater than 3 months had less negative changes in utilization, but this difference was not significant. This review and meta-analysis provides strong evidence that health care utilization declined substantially during the early and peak phases of the 2013-2016 Ebola outbreak in West Africa. Furthermore, the magnitude of the decline in utilization was associated with local EVD incidence, and remained in studies that controlled for background seasonal variation in health care utilization. These findings corroborate the likely existence of a causal link between the occurrence of the EVD outbreak and the concomitant changes in health care utilization. We also found that utilization declined across all service types, but some services were more resilient than others. In particular, inpatient services, including facility deliveries, were more severely affected than outpatient services. Encouragingly, the estimated change in utilization in areas that had <0.5/100,000/week Ebola incidence was only -0.5%. This suggests that the effects of Ebola on health care utilization did not spillover to areas with little to no Ebola. However, it should be noted that levels of utilization in the three countries were inadequate before the outbreak. This systematic review and meta-analysis has a number of limitations. Foremost, we are limited to studies that have been published, and there is evidence suggestive of publication bias. Estimates derived from small numbers of facilities or shorter periods tend to have larger declines. However, this potential bias does not entirely explain the observed decline in utilization. For studies with more than 50 facilities, the change in utilization is still -9.5% with a t test p-value of 0.003. Second, nearly all studies were based on pre-post designs that did not account for secular trends in health care utilization. This would have required a control group that was not exposed to the EVD outbreak, along with the use of difference-in-differences estimates. The absence of a control group to model the counterfactual could bias our estimate of the effect of EVD on utilization. Reviewed studies mostly address the situation in late 2014, at the peak of the EVD outbreak, and we cannot infer the effects during the latter part of the outbreak. Delamou et al. (2017)  and Bienvenu et al. (2017) , both published too late to be included in this review, found that number of ANC visits and facility-based deliveries in the forest region of Guinea had not recovered to pre-Ebola levels as late as July of 2016. Other limitations were introduced by the methodology used in this literature review. Lacking data on facility catchment areas, we do not weight estimates to account for the population affected, nor do we control for the non-random distribution of study locations across the three countries. Double counting of data for the same services at the same facilities during the same periods does occur, which violates the assumption of independent errors and results in standard errors that are too small. However, overlap is most common for national-level estimates that include the same areas as sub-national data. After stratifying by level in Table 2, the effect of EVD on health care utilization remains significant. Overall, given the methodological limitations and presence of some bias, the estimates reported in this study should be taken as indications of the effect that EVD may have had on health services, rather than as precise estimates of that effect. Finally, this review was not designed to decipher whether the decline in utilization observed was primarily due to supply or demand-side factors. This is important, since trust in health services is harder to rebuild than supply-side barriers (eg, staffing, infrastructure). We are also unable to quantify the impact of declining utilization on health outcomes such as morbidity or mortality. Declines in utilization may be due to less ill patients avoiding health facilities. Care not received at formal sector facilities may have been obtained from community-based or informal providers, who are a common source of care for childhood illness in West Africa . However, declines were largest for non-elective procedures with no alternative source of care than formal sector facilities, such as C-sections, facility-based deliveries, and inpatient admissions. Therefore, the impact on health outcomes may have potentially been substantial. Beyond its direct death toll, the West African EVD outbreak significantly reduced health care utilization in the most-affected populations. The impact of this indirect effect on health and mortality from non-EVD causes, however, remains unknown. Given a large reduction in health service utilization over a large population for a period of up to 12 months, it has the potential to cause a number of additional deaths that might have exceeded Ebola’s direct impact. Estimates of this indirect toll will require modeling the consequences of the declines in health care utilization described in this paper, as well as retrospective mortality surveys (eg, Demographic and Health Surveys). In future outbreaks, the public health response must aim to maintain utilization of routine health services while also controlling the epidemic. We would like to thank the two reviewers, Nikita Viswasam and Joanna Lai, for their assistance, and Claire Twose for her help with the literature search strategy. Guy Harling provided two articles that had not been identified through our literature search. Caitlin Kennedy provided input on the design of the study. We would like to acknowledge researchers and study teams that generated the data on which the articles included in this review are based. In particular, the data collectors who visited health facilities at great personal risk should be commended for their courage and dedication. Disclaimer: The views presented in this article represent the authors alone and do not represent the views of UNICEF. Funding: This project was funded through a Programme Cooperation Agreement between the West and Central African Regional Office (WCARO) of UNICEF (Dakar, Senegal) and Johns Hopkins University (Baltimore, USA) The funder had no role in study design or in the decision to publish results. Authorship contribution: SH conceived of the study and secured funding. JW and SH refined the literature review strategy and designed the data abstraction tool. JW supervised article screening and data abstraction. JW conducted data synthesis and meta-analysis. JW and SH drafted the article and give final approval for publication. Competing interests: The authors have completed the Unified Competing Interest form at www.icmje.org/coi_disclosure.pdf (available on request from the corresponding author), and declare no conflict of interest. World Health Organization. Ebola Situation Report - June 10, 2016. 2016. Available: http://apps.who.int/iris/bitstream/10665/208883/1/ebolasitrep_10Jun2016_eng.pdf?ua=1. Accessed: 26 March 2017. World Bank Group. 2014-2015 West Africa Ebola Crisis: Impact Update. May 10, 2016. 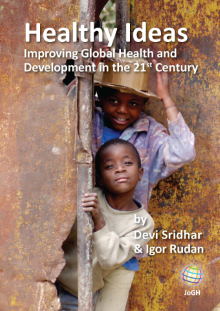 Available: http://pubdocs.worldbank.org/en/297531463677588074/Ebola-Economic-Impact-and-Lessons-Paper-short-version.pdf. Accessed: 24 April 24 2018. European Center for Disease Prevention and Control. Outbreak of Ebola virus disease in West Africa - 12th update. 2015. Available: https://ecdc.europa.eu/sites/portal/files/media/en/publications/Publications/Ebola-west-africa-12th-update.pdf. Accessed: 13 December 2016. KA Grepin CR. Using SMS data to monitor exposure to the Ebola outbreak and to estimate its impact on health seeking behaviour in Liberia. 2015. Available: https://www.theigc.org/wp-content/uploads/2015/06/Economic-impacts-of-Ebola-Bulletin-5.pdf. Accessed: May 28. UNICEF. Assessing the impact of the EVD outbreak on health systems in Sierra Leone. 2014. Available: https://www.unicef.org/emergencies/ebola/files/SL_Health_Facility_Survey_2014Dec3.pdf. Accessed: 3 December, 2016. UNFPA. Rapid assessment of Ebola impact on reproductive health services and service seeking behaviour in Sierra Leone. Freetown: UNFPA, 2015 March 2015. Report No. : Contract No. : January 17. Liberia MoHaSW. Annual Report 2014. 2015. Available: http://reliefweb.int/report/liberia/ministry-health-and-social-welfare-annual-report-2014. Accessed: 13 December 2018. Higgins JPT, Green S, editors. Cochrane Handbook for Systematic Reviews of Interventions Version 5.1.0 [updated March 2011]. The Cochrane Collaboration, 2011. 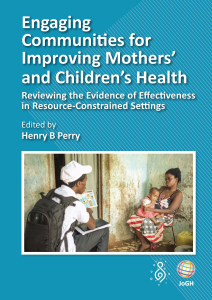 Available from http://handbook.cochrane.org. StataCorp. 2017. Stata Statistical Software: Release 15. College Station, TX: StataCorp LLC. Center for Disease Control and Prevention. 2014 Ebola Outbreak in West Africa - Reported Cases Graphs. 2016. Available: https://www.cdc.gov/vhf/ebola/outbreaks/2014-west-africa/cumulative-cases-graphs.html. Accessed: 17 February 2017.